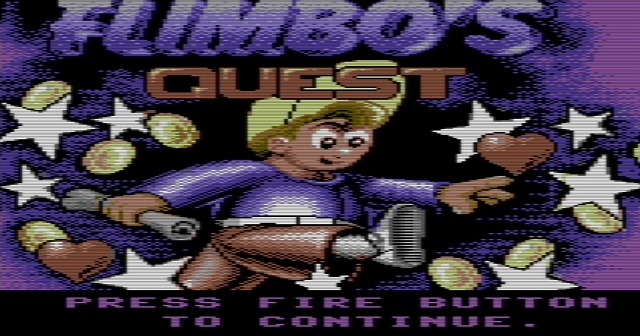 This hot Summers day has just got even better as EDK,SAM have released the [Easyflash] version of 'Flimbo's Quest' for the C64, but with added intro! A game first released by System 3 for the C64, Amiga, Atari ST and Amstrad CPC in 1990, is a 2D Platformer with great retro detail, great gameplay and a soundtrack that is so upbeat you'll find it hard to stop listening to. Playing as Flimbo, you are on a quest to rescue Pearly, the beautiful queen of DewDrop Land who has been kidnapped by the evil Dandruff. Thanks to the help of professor Dazz Bazian, it's down to you to collect all the scrolls and to give them to the processor in order to be taken from level to level and eventually to Dandruff's Lab and rescue the damsel in distress! Flimb's Quest is a great game indeed and now that it's an Easyflash with added intro, you simply have to have this in your collection!